Where the automotive industry stands now. Explore the 5 future trends shaping the automotive industry. Take a look at possible future winners in this space. Key long-term trends are underway in the automotive industry. There will be a major transformation over the next decade. Technology is significantly advancing for vehicles. Through the year 2030, we are likely to see an increasing amount of electric vehicles on the road. There is also likely to be more autonomous vehicles and ride-sharing. According to a PwC report, there are five main trends that will transform the auto industry through 2030. They are summed up in the acronym ‘EASCY’: electrified, autonomous, shared, connected, and yearly updated. Most traditional automakers have been experiencing stagnant or declining growth over the past few years. Total automobile sales for 2018 in the United States only increased 0.3% over 2017. That was better than what was expected. There were 17.27 million vehicles sold in 2018 as compared to 17.25 million in 2017. It is difficult for the traditional automakers to grow when total sales only inch up by a small percentage basis year over year. This stagnant growth is reflected in the stagnant stock prices for the traditional automakers. Sales of vehicles in the U.S. are expected to decline by 1.2% to 4% in 2019. One company that is bucking the stagnant vehicle sales trend is Tesla (TSLA), which has been achieving strong double-digit revenue growth. This is a result of the company’s stylish and functional electric vehicles, which resonates with high-end consumers. The traditional automakers: Ford (F), General Motors (GM), Fiat Chrysler (FCAU), Toyota (TM), Honda (HMC), Volkswagen (OTCPK:VWAGY), Nissan Motors (OTCPK:NSANY), Volvo (OTCPK:VLVLY) etc. will have to adapt to the new transition to electric vehicles and ride-sharing trends. This will be paramount for their survival. Tesla’s Model 3 was the best-selling electric car in 2018 with the Model S and X being the 4th and 5th best-selling electric vehicles respectively. This led to Tesla’s strong revenue growth of 82.5% for 2018 over 2017. Tesla achieved profitability in Q3 and Q4 of 2018. Tesla is expected achieve profitability in 2019 according to consensus estimates. However, that is not a guarantee since the company is changing rapidly. The concern with Tesla is the sustainability of their profitability. It is not clear that the company will be able to achieve sustained profitability by producing lower-priced Model 3 vehicles that average consumers can afford. The actual retail cost of the Model 3 has been higher than the original $35,000 target price. A survey shows that the average selling price for a Model 3 in 2018 was between approximately $55,000 and $59,000. This price range may have priced the Model 3 out of the affordability range for the average consumer. Tesla recently announced that they are now offering the Model 3 for the $35,000 price. The company is also winding down their retail store operations to sell their cars online on a global basis to reduce costs. The uncertainty regarding Tesla’s ability to profitably sustain its business over the long term has been reflected in a choppy, range-bound stock price since the beginning of 2017. This led some investors to consider Tesla as a trading stock (buying the dips and selling the rips). One primary trend is that vehicles will increasingly become electric. Concerns about climate change, especially with younger generations creates the need and desire for cleaner vehicles. As technology advances and electric vehicles are able to increase their mileage between charges, they are likely to see increased sales. 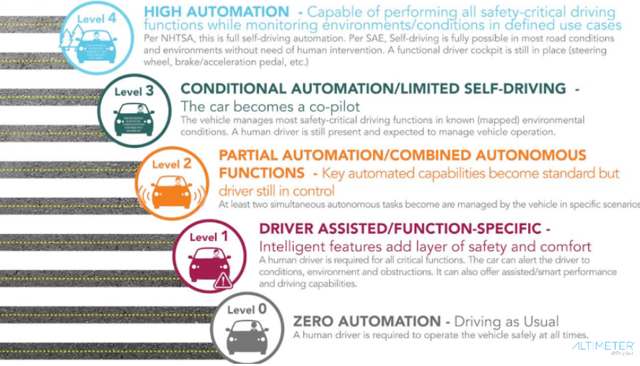 Vehicles are expected to increasingly move toward autonomous capabilities. This will occur in stages. Level 4 and 5 vehicles are likely to become available in the 2020s. (Level 5 is fully autonomous with vehicles that can operate on any road under any condition that a human could). However, they will probably be limited among the high-end expensive vehicles initially. Another likely scenario is for trucks and buses to also become autonomous in the early stages. Older qualified truck drivers are retiring and it may be difficult for them to be replaced. The trucking industry is expected to need 900,000 new drivers over the next decade. The industry is having a tough time filling the 100,000 job opening in the current market. Therefore, autonomous trucks will be a viable way for the trucking industry to keep up with demand. Consumers may not have a strong need for autonomous vehicles right away. The need for businesses to run efficiently is another story. This need will drive the use of autonomous vehicles in the trucking industry earlier than wide adoption among consumers. 3. Vehicles are expected to be increasingly shared through 2030. This is likely to occur in urban areas and in Europe. Fleets of vehicles could take commonly traveled routes back and forth for commuters to get to and from work, sports events, concerts, etc. Car-sharing would allow users to pay per minute or mile without worrying about ownership. Some vehicle owners could make their vehicles available for sharing for extra money. Sixty percent of Europeans stated they would be prepared to share their car for money. 4. Vehicles are expected to be increasingly ‘connected’ via internet and cloud. Vehicles will be connected to traffic management infrastructure and with other cars. Vehicles will also be connected to passengers and pedestrians. Perhaps vehicles will send warnings to pedestrians’ phones when they are too close. 5. Vehicles are likely to be ‘yearly’ updated. Annual updates will replace the current 5 to 8-year cycle for major updates. Trucks and cars are likely to run more frequently as a result of being used differently. Autonomous trucks won’t need to take sleeping breaks. They may need some charging time, but that could take less than a full night’s sleep for a driver. Vehicle-sharing is likely to have cars on the road more often. The increased frequency of usage creates the need for short replacement cycles. Vehicles are expected to travel for more miles and they are used more intensively. The short update cycles will also be for the latest hardware/software developments. Vehicle inventory on the roads is expected to decrease significantly according to PwC. This could be because of the expected increase of shared vehicles on the road lessening the total amount owned by consumers. However, vehicle sales are expected to rise because the vehicles will need to be replaced more often as a result of more frequent useage. Expected inventory decrease by country by 2030: Europe 25% decrease, United States 22% decrease, and China 50% decrease. There will be rapid R&D investments by auto manufacturers and related businesses. Total mileage is expected to increase as the amount of shared vehicles increases. Instead of cars sitting around in parking lots while people are at work, shared vehicles will be in use wherever driving needs arise. This will increase total mileage. Decisions regarding long-term structure and regulations for autonomous vehicles are expected to occur between 2020 and 2025. Auto manufacturers and suppliers will have shrinking margins, but will have to invest in innovations to keep pace with the new demand. The lower manufacturing margins could lead to automakers providing mobility services (running a fleet of shared vehicles) to boost margins. So, the future business model for automakers may include: manufacturing, sales and the operation of shared vehicles. About 50% of mileage driven in China, 40% of mileage driven in Europe and 36% of mileage driven in the U.S. could be covered by autonomous vehicles by 2030. By 2030, total mileage driven may increase by 24 in the United States, 28% in Europe, and 183% in China. 55% of all new car sales could be fully electric by 2030. 95% of new car sales are expected to be partially electric by 2030. During the transition period to autonomous, annual vehicle sales are expected to increase by 40% to 24 million units in Europe, up 30% in China to 35 million units, and up 20% in the United States to 22 million units. Ride-sharing in Europe is expected to grow at a CAGR of 20% by 2030. This will take ride-sharing from 1% currently to 10% by the mid 2020s and 25% by 2030. Ride-sharing in the United States is expected to increase from 1% to 33.5% in 2030. The fastest growth for ride-sharing is expected to be in China. By 2030, 45% of personal mileage in China is expected to be from shared vehicles. There is new promising battery technology that may allow electric vehicle owners to recharge their batteries in a similar way that we do now - with a liquid. This technology is known as flow batteries. Flow batteries can be charged in minutes with a liquid containing electrolytes. This looks like a practical solution to consumers’ concerns of being limited by a range of miles or long charging times for electric vehicles. Flow battery technology has been around since the 1980s. However, the old flow batteries were too heavy for vehicles. The new flow batteries are light enough for vehicles. They can be filled as quickly as we fill cars with gasoline. Flow battery technology has the potential to be added quickly to existing infrastructure because a liquid-moving and storage system is already in place for gasoline. However, the concerns about cost, safety and reliability for flow batteries still need to be resolved before this could be put into widespread use. Zinc-air batteries are another possibility for electric vehicles. They have the advantage of being lighter and less costly (don't use cobalt) as compared to lithium-ion batteries. Zinc-air batteries are also not flammable, giving them another key advantage over lithium-ion. Zinc-air batteries are already used in hearing aids, watches, and in cell phone towers. The challenge for zinc-air batteries is that when you try to recharge them, dendrite crystals grow, which can short-out the battery when they get large enough. However, technology is being developed to reduce dendrite growth to prevent shorting. So, zinc-air batteries will be an important development to watch for electric vehicles as well as for grid storage in the future. Currently, a private company, NantEnergy, has been successfully developing zinc-air battery technology. There are also other small players in the industry, but nothing that I would declare as investment worthy at the moment. We'll keep an eye on this as developments are achieved. The best investments for this trend may not be the traditional automakers. The traditional automakers already have thin margins. These margins will be under more pressure as R&D spending will have to ramp up to keep up with the rapidly-changing technological advances. The traditional automakers are likely to add ride-sharing services to their business model over the next decade to increase margins. It is not clear how successful they would be with this endeavor, especially with so much competition. Although the traditional automakers have their challenges, I wouldn’t count all of them out either. However, I would like to get a better read on who the best players will be before making an investing decision. Most of the traditional automakers are developing autonomous vehicles. They are also operating ride-sharing services. However, we will have to see how their fundamentals progress in the face of so much competition and thin margins. 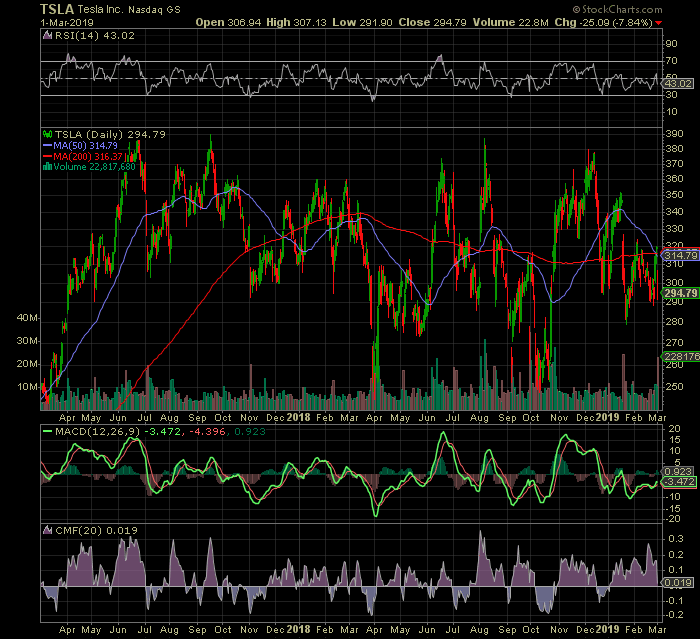 Tesla is a company to consider for the next decade. They are just recently turning a profit and have been strong on innovation. The innovation is likely to continue as the company moves through the stages of getting closer to autonomous vehicles. Tesla is achieving strong above-average revenue growth. So, if the company can continue to improve operations to achieve annual earnings growth in additional to revenue growth, Tesla could be a solid long-term investment. Above-average revenue and earnings gains will help drive the stock over the next decade if the company can operate with sustained profitability. Tesla has a good knack for resonating with consumers. They are a brand that consumers aspire to. Tesla is also a brand that has an environmentally-friendly vibe, which attracts those who want to lower their carbon footprint. However, a focus on the company’s fundamentals (margins, balance sheet, and earnings growth) will also be important to monitor. There might be a better entry point for the stock in the near future - so we'll keep an eye on that. Apple (AAPL) and Alphabet (GOOG) (NASDAQ:GOOGL) could be winners in this space. Apple’s Project Titan and Google’s Waymo are their electric/autonomous vehicle endeavors. It will be interesting to see how these companies develop their technology and how they will emerge in the automotive industry. Uber resumed their testing of autonomous vehicles in December after halting the testing as a result of a fatal accident involving one of their test cars. Uber is expected to launch their IPO in 2019. That will be a company to watch in this space as they progress with their efforts. Lyft is also testing the use of autonomous vehicles. Lyft just recently filed for their IPO, which will trade under the ticker symbol (NASDAQ:LYFT). Uber didn't file for their IPO yet. Other possible winners could include technology companies such as: Intel (INTC), Microsoft (MSFT), Nvidia (NVDA), AMD (AMD), and Cisco (CSCO) that are expected to be the technological guts and support in future vehicles. Albemarle (ALB) produces the lithium used in the batteries of electric vehicles. The company has the potential to be a long-term winner. Albemarle has some new found positive stock price momentum in 2019. We’ll have to see how things progress and keep an eye on the supply/demand situation for lithium. We'll also have to watch for newer battery technology that could replace lithium in the future. Currently, we have Level 2 vehicles on the road. These level 2 vehicles have 2 or more driver assist features that can control the vehicle in a coordinated operation. These features/systems include: adaptive cruise control, active lane-keep assist, and automatic braking. However, humans are still required to control the vehicle. The projections included in the article could take longer than expected for getting fully autonomous Level 5 vehicles on the road. Regulations/government approval will have to be in place for the operation of fully autonomous vehicles. The safety of these vehicles will have to be at a high standard for widespread use. Although it may not be clear who the definite winners will be for the future of the automotive industry, the companies presented here can be placed on a watch list. We can watch to see how things develop in the industry and which companies have the best fundamentals. It may not be necessary to pick individual companies in this space. You could always consider an ETF such as the Global X Autonomous & Electric Vehicle ETF (DRIV), which holds multiple companies. Most of the largest holdings in DRIV are tech companies, which might be the area to focus on for the long-term for the automotive industry. It is not necessary to jump in as an investor in this space just yet. The industry will be something to keep an eye on for any emerging winners. I will be taking a closer look into this field in future articles. Let me know your thoughts on the industry in the comment section below. I've been contributing to Kirk Spano's Margin of Safety Investing [MOSI] service, where we offer a more in-depth analysis of individual companies. Disclosure: I am/we are long AAPL. Business relationship disclosure: The article was written by David Zanoni with guidance from Kirk Spano. Additional disclosure: The article is for informational purposes only (not a solicitation to buy or sell stocks). David is not a registered investment adviser. Kirk Spano is an RIA. Investors should do their own research or consult a financial adviser to determine what investments are appropriate for their individual situation. This article expresses my opinions and I cannot guarantee that the information/results will be accurate. Investing in stocks involves risk and could result in losses.